Backcountry cookbooks tend to stick to a single cooking approach, ranging from “just add boiling water” to cooking from scratch. You may need to sample a few cookbooks until you find one that matches your style. Freezer Bag Cooking by Sarah Kirkconnell is a guide to making your own just-add-water backcountry meals. Most ingredients are available at your supermarket. Compared to pre-packaged freeze-dried meals, these have twice the food and cost half as much. Read carefully, though, some of the recipes serve two people and some serve only one. NOLS Cookery is the best book for working from bulk food. This is a different style than planning each meal, but effective for larger and more frequent expeditions. NOLS Cookery uses a fixed set of staples with a few extras for a wide variety of meals which are combined, prepped, and cooked on the trail. No at-home prep, just flat-out cooking on the trail. Be prepared to buy a Banks Fry-Bake, NOLS loves that pan. If you know how to use it, it is both a frying pan and a dutch oven. NOLS Cookery also has great info on building wood fires, planning the right amount of calories for a trip, and bear protocol. Even if you don’t cook the NOLS way, you can get some valuable information from this book. 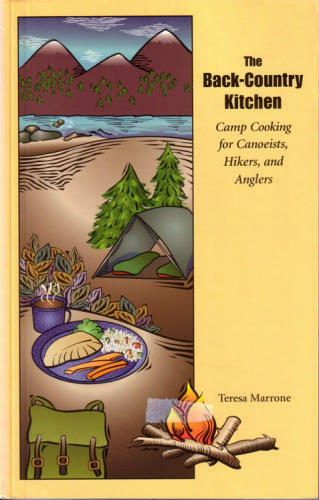 The Back-Country Kitchen by Teresa Marrone mixes supermarket-available and home-dehydrated ingredients for rehydration or minimal cooking on the trail. The recipes vary in complexity from dressing up instant grits with cheese and egg to Cajun Venison Tenderloin. They also range from backpacking to cabin cooking. The twenty page chapter on dehydrating food at home is all you’ll ever need and probably worth the price of the book. Want to know how to dry eggplant or kiwi? It is covered concisely, with equivalents between dehydrated and fresh so you can adapt recipes. With home-dried ingredients, you are ready for these tasty recipes or the simpler ones in Freezer Bag Cooking, your choice. Of course, the recipes are also worth the price. Look for yummies like planked fish held down with bacon or cabin cooking with a can of cherries to season the venison. I made a the Lentil-Bulgur Chili with fresh ingredients at home and the family declared it a keeper. People love the same recipe in the backcountry with dehydrated veg. Overall, this is my favorite trail cookbook. The entrees in Lipsmackin’ Backpackin’ by Tim and Christine Connors are yet another style, where you combine and cook ingredients at home, then dehydrate the results. I have the book, but I don’t think I’ve ever cooked anything from it. If you do not want to dehydrate at home, I recommend getting some samplers of dehydrated vegetables from Harmony House. That will get you through most of the trail recipes in Back-Country Kitchen. Most recipes only need a tablespoon or a quarter cup, so a one cup bag will last a while. The sampler makes a nice Christmas present, too. I have a pretty good collection of camping cookbooks, including those my dad bought in the 60’s. You want Bradford Angier’s opinion on moose muzzle? I can find it. He says it is even tastier than bear. I recommend getting a few books and trying a few styles. You’ll have to go camping to really try them, but that isn’t a problem, right?